Google+ Reading Teen: My Bookish Crafty Project for the Rooftop Party of BEA 2012! My Bookish Crafty Project for the Rooftop Party of BEA 2012! So, the wonderful and oh-so-sweet Liza Wiemer of WhoRuBlog asked Andye and I (along with Jeremy and Jeffrey West of Novel Thoughts) to help throw a party for bloggers and authors who attended BEA 2012. To make a long story short, I offered to do the decorations. Now, I didn't want just any decorations, it's a party based on books, so I thought... "Why not make the decorations out of books...hmmm". This opportunity came at just the right moment, because I had just finished Andye's birthday gift; the very challenging Harry Potter lamp. As you can see (in my humble opinion) the lamp turned out great! So I felt like I was on fire in the crafty department. 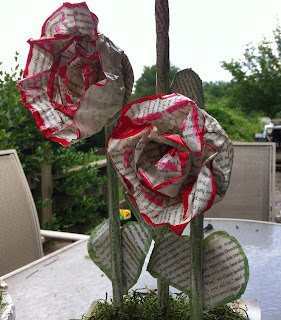 So I started to make flowers out of Wuthering Heights, and it again turned out to be a very long, tedious, messy project. Frustrated. Dog in lap. Scissors in right hand. Wine in left hand. In the end, it was all worth it. Enjoy my pics. So in the end, I really enjoyed making these projects. I learned alot, and how not to burn myself with the hot glue gun. I have more bookish projects to come in the future, so stay posted! I so wanted those purple flowers! Haha, I put like ALL my raffle tickets into that one. But alas, someone else is enjoying them. The crafts and the party were beautiful. omg you serious?! that looks amazingggg! I didn't know about that talent of yours! Ok, LOVE this Amy! 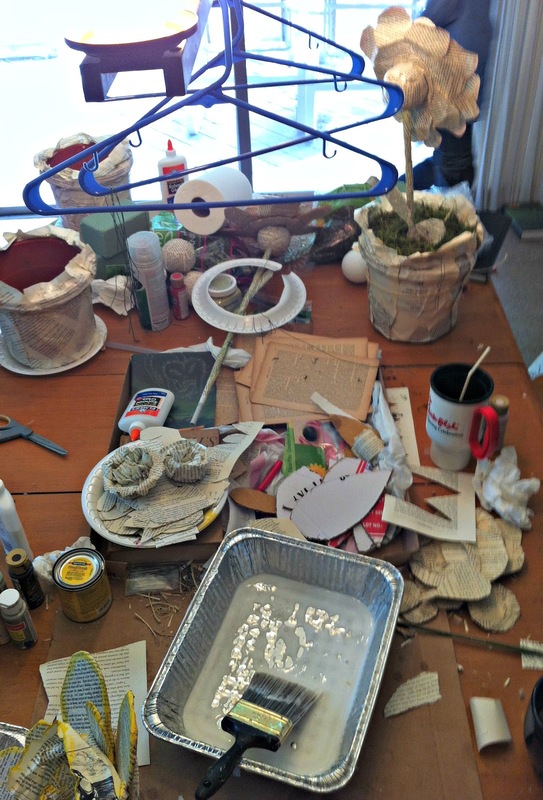 I love these types of crafty projects! 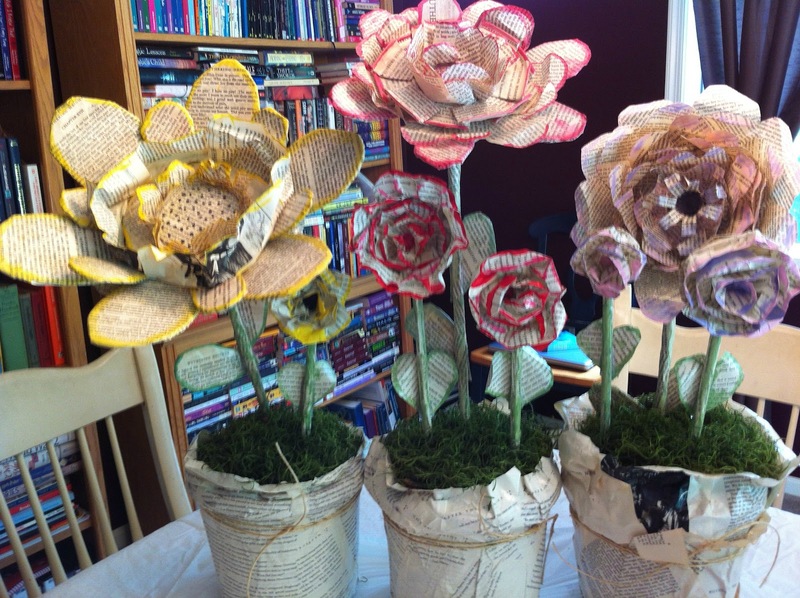 Especially repurposed books. I made a NOOK cover out of my daughter's One Fish Two Fish book that I just adore! Love the flowers! Just so you guys know, I really try and find really old messed up, used books to take apart! That is amazing Amy!! The lamp, the flowers, the wreath, everything looks awesome. I do not have that kind of crafty patience. I'm feeling tense just thinking about it. Amy, you are so incredibly talented. Everyone was going crazy over the wreath and the floral arrangements. They really made the Rooftop Party extra special. All the time you put into making them! Wow. Next time, the hosts get raffle tickets too, so we have a change of winning one of your amazing pieces. Haha, I know who you are... They say a lot, don't they?! Those are absolutely gorgeous!!! I especially love the flowers. You guys are seriously talented. I want to know how you made that lamp shade!! I would love to have one of those in my house! I LOVE the flowers and the colors you chose. The lamp is awesome too. Such a great idea to use something so awesome as a book to make some else. Absolutely fabulous. And so creative. Thanks for sharing with those of us that didn't get to see it! Did you just use mod podge on the Harry Potter lamp? It's such a creative idea, I love it!